It is fun to buy holiday gifts for adults, of course, but nothing beats the surprise and joy that registers on a child's face when they open their new toys on Christmas morning. Yes, it's okay to give socks and sweaters, but all kids want to tear into something fun and entertaining that Santa left for them, right? And this year one of the most well-known names in great toys, Hasbro, has a huge selection of items that kids of all ages will be sure to love. Being able to browse by brand, category, gender and age really makes it easy to narrow down to the Hasbro toys for the child on your list... although there are just so many that look like fun! 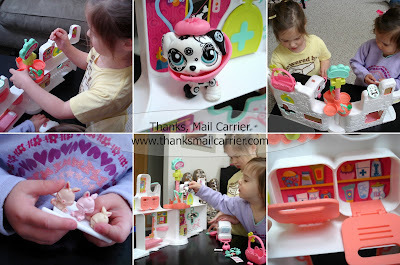 Never being ones to turn down the opportunity to try out a great new toy, Big Sister E and Little Sister B couldn't wait to see the Tonka Chuck & Friends Rumblin' Chuck Vehicle and Littlest Pet Shop Rescue Tails Center Playset and see just how much entertainment they would provide. The Tonka Chuck & Friends Rumblin' Chuck Vehicle was providing quite a few laughs and raised eyebrows before it was even out of the box. 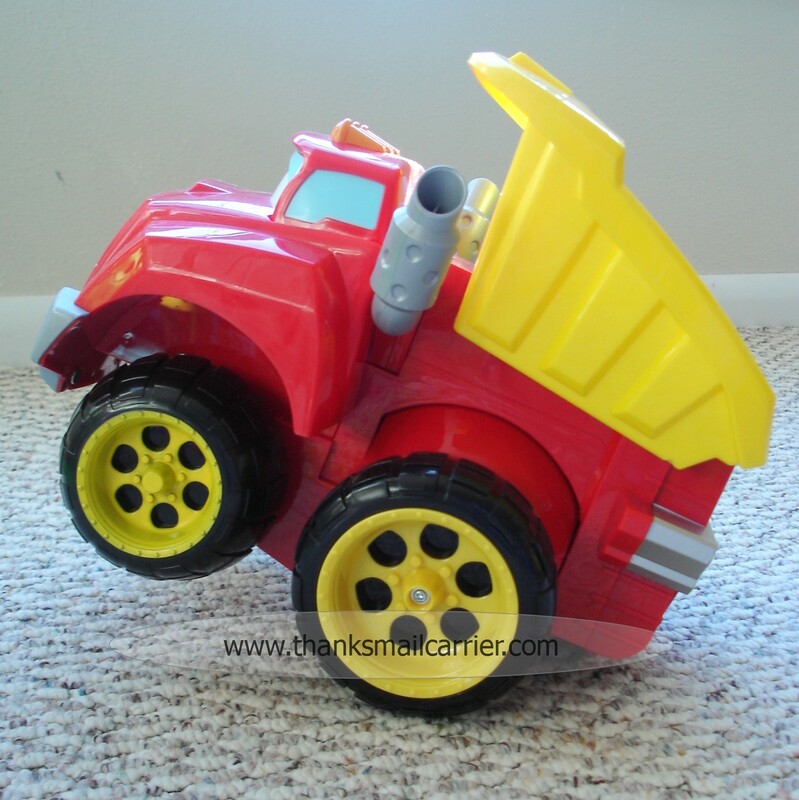 We've seen trucks and we've seen toys that make noise before, but never like this! As soon as he is turned on, Rumblin' Chuck has lots to say and places to go. With more than 50 sounds and phrases, Chuck is able to keep a child's attention due to all of the talking, spinning, wiggling, wheelies and more that he has hidden up his sleeve. Right away my girls realized that by pressing down on any of his various pressure points or by picking him up by the truck bed that it would activate his silly phrases and exaggerated antics. But Rumblin' Chuck does more than just say friendly quips, he is interactive. 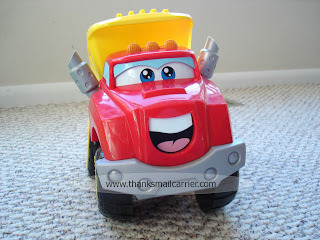 When this happy truck is being loaded up, he'll call out "Load me up!" but then when there are too many items, he will shake them out all over the floor, causing a great deal of laughter. Pick him up and he'll comment, "Whoa, whoa, whoa! Where are we going?" and then when placed back down he says something like, "Whew! Good to be back on the ground." My kids couldn't get enough of the anticipation of waiting to see what Chuck would do and say next! As much fun as the kids had, I was glad to see the simple power switch right on the bottom of Chuck for those times that a little peace and quiet were needed. Even though this toy is recommended for ages 3+, I couldn't think of a reason why younger kids couldn't have a blast playing with it (Little Sister B sure does). The combination of Chuck's happy disposition and surprise sayings with the cute storybook that comes along means we have a unique experience every time we pull him out! Then, for the times when Big Sister E has been looking for quieter play and a feeling of responsibility, she has had a good time with the Littlest Pet Shop Rescue Tails Center Playset. Being our first introduction to the Littlest Pet Shop line, Big Sister E was immediately taken with the cute Dalmatian puppy (and it's bobble head) and all of the miniature pieces and accessories that came along with this set to keep animals healthy. For ages 4 and up, there are quite a few parts that could be choking hazards, so although Little Sister B was also drawn to this cute set, I did keep a close eye on her with it. The full-service veterinary hospital itself had multiple rooms and included plenty of equipment to cure all of the imaginary ailments that we could come up with. The hidden hinge made it easy to open and close things up and the compact size made it easy to move and store when we were done. Done? Even from the first time that we pulled this out, I wasn't sure that my girls were ever going to be done playing with it. Little Sister B pushed and pulled the ambulance to see the red emergency lights and took x-rays of the poor ill bunnies that were inside (she was very into the three cute bunnies) while Big Sister E liked to spin and turn the IV bed-basket down the middle. 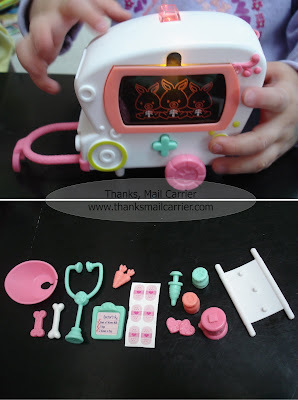 From the medicine stored in the cabinets to the icepack, stethoscope, Band-aids and much, much more, it was fun for me to just sit back and listen to the pet stories and remedies that my kids came up with in the Rescue Tails Center. 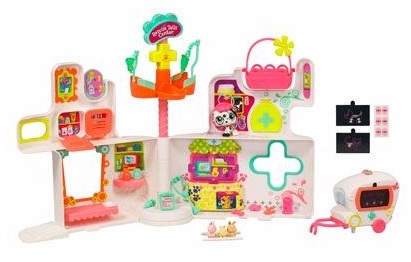 With so many different nooks and crannies and aspects for play, I could see why the Littlest Pet Shop collection is such a popular line. Unlike some of the other, more structured and predictable toys, Hasbro has a lot of great options that are sure to keep kids' attention for hours of fun playtime. We have had a great time with both Rumblin' Chuck and the Rescue Tails Center and I have no doubt that they would both make great surprises to find under the tree! For more fun, high quality toys of all kinds, visit Hasbro to shop, play and discover all that is going on over there. 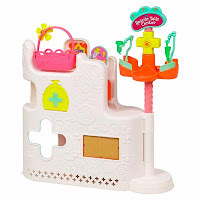 Plus, head over to A Mom's Balancing Act for her thoughts on the Tonka Chuck & Friends Rumblin' Chuck and the My Little Pony Remote Control Rainbow Dash Plane. So much fun! Zoe is a big fan of Littlest Pet Shop. She received a great set for Christmas last year, and has played with it non stop. Hasbro has great toys. Chuck looks fun!